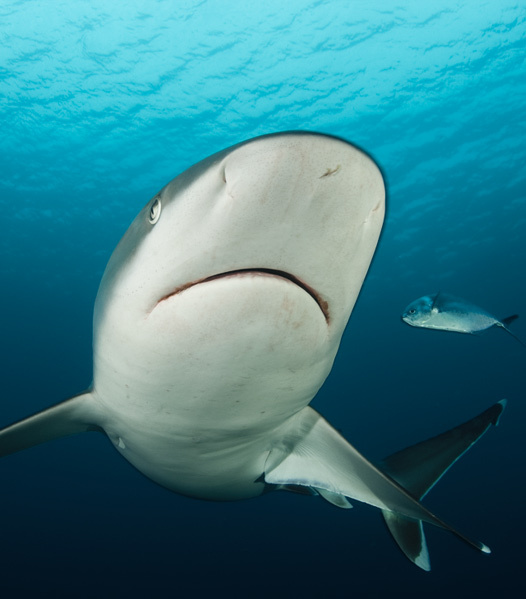 Sharks are “top predators” in the trophic chain, and with respect to other organisms (bony fish, crustaceans, mollusks), these have a lower reproductive rate and natural mortality. These characteristics make sharks particularly vulnerable to overexploitation; since under constant catch pressure, they will take much longer to recover. Despite this, in the last two decades, the shark-targeted fishery has intensified. A recent global assessment with data from the International Union for Conservation of Nature (IUCN) determined that a quarter of all species of sharks and rays are endangered, which makes them the most threatened group of marine vertebrates today. Cocos Island is known as the “island of sharks” as it is one of the few refuges in the world where it is still possible to observe great abundance of several species of sharks, which is why it is visited by hundreds of tourists every year. This World Heritage Site has the largest gatherings of hammerhead sharks (Sphyrna lewini) of the world, here in the Pacific Ocean, together with other major pelagic species. Thus, it is one of the most important genetic banks of the Eastern Tropical Pacific. 14 species of sharks have been reported in the CINP (Bussing & López, 2005, Cortés et al., 2012). Some species are residents, such as the whitetip reef shark (Triaenodon obesus), while others are highly migratory, such as the hammerhead shark (S. lewini) and the whale shark (Rhincodon typus). The seamounts, islets, and bays of the CINP represent essential habitats (areas for feeding, resting, cleaning, copulation) for the different shark species. List of species: Sharks reported for Cocos Island National Park and Seamounts Marine Management Area (Prepared by FAICO based on Bussing, & López, 2005, Cortés et al., 2012). Source: Prepared by FAICO, based on Bussing, & López, 2005; Cortés et al., 2012. The Cocos Island National Park (CINP) is part of the Marine Corridor of the Eastern Tropical Pacific (CMAR). In order to implement transboundary conservation strategies for pelagic species such as sharks, rays, and turtles, it is necessary to generate information about habitat use, living patterns, and migratory routes (Hearn et al., 2014). The information on the movement of species allows identifying other sites of importance for conservation within the Eastern Tropical Pacific Ocean, where it will be necessary to implement management actions.Despite the efforts that have been made to mark several species of sharks, migratory movements between the continental islands of the Eastern Tropical Pacific Ocean have been clearly documented only for Sphyrna lewini (hammerhead shark). However, the CINP and the AMM-MS are important sites for many other pelagic species. In the case of the CINP, numerous studies on sharks, on their population, and on their migration patterns are being carried out thanks to organizations such as the Friends of Cocos Island Foundation (FAICO), CIMAR-UCR and Misión Tiburón (e.g. Zanella et al., 2015), which in collaboration with the Cocos Marine Conservation Area (ACMC-SINAC) seek to provide information on the benefits of proper management of these marine protected areas. Abercrombie, D. L., Clarke, S. C., & Shivji, M. S. (2005). Global-scale genetic identification of hammerhead sharks: application to assessment of the international fin trade and law enforcement. Conservation genetics, 6(5), 775-788. ACMIC (2002). La presentación de informes periódicos sobre la aplicación de la convención del patrimonio mundial. Sección II: Estado de conservación de bienes específicos del Patrimonio Mundial. San José, Costa Rica: UNESCO. Bussing, W. A., & López, M. I. (2005). Peces de la Isla del Coco y peces arrecifales de la costa Pacífica de América Central meridional/Fishes of Cocos Island and Reef Fishes of the Pacific Coast of Lower Central America. Revista de Biología Tropical, 53(Suplemento 2), 5-192. Dulvy, N. K., S. L. Fowler, J. A. Musick, R. D. Cavanagh, P. M. Kyne, L. R. Harrison, J. K. Carlson, L. N. Davidson, S. V Fordham, M. P. Francis, C. M. Pollock, C. A. Simpfendorfer, G. H. Burgess, K. E. Carpenter, L. J. V Compagno, D. A. Ebert, C. Gibson, M. R. Heupel, S. R. Livingstone, J. C. Sanciangco, J. D. Stevens, S. Valenti, and W. T. White. 2014. Extinction risk and conservation of the world’s sharks and rays. Hearn, A.R., Acuña, D., Ketchum, J.T, Peñaherrera, C., Green J., Marshall, A., Guerrero, M., y Shillinger, G. (2014). Elasmobranchs of the Galapagos marine reserve. En Denkinger, J., y Vinueza, L. (Eds. ).The Galapagos Marine Reserve (pp. 23-59). Nueva York, EE. UU: Springer International Publishing. SINAC (Sistema Nacional de Áreas de Conservación). 2018. Diagnóstico para los Planes de Investigación del Área de Conservación Marina Cocos (ACMC). San José, Costa Rica. 60p. Zanella, I., López, A., Martínez, F., Golfín, G., Morales, K. 2015. Poblaciones de tiburones en las Bahías Chatam y Wafer del Parque Nacional Isla del Coco, Costa Rica. Rev.Biol.Trop. 64(Suppl 1): 177-186. Febrero 2016.